Those are essentials in delivering real values out of software products into the market and the society. In the rapidly changing business environment, flexibility, or being "Agile" is crucial, or we work hard only to deliver an antique that would not have practical value in the new reality. We engineers like a rigid plan and execution, but aren't we often stubbornly following the plan that was perfect only for the obsolete reality? Being transparent about what we do, always inspect if what we planned still makes sense to the current reality, and adapt us to the new reality even if it means to rip off the initial design. We use Scrum to be Agile. All the framework of Scrum, from daily stand up meetings to the small iteration cycles, now make more sense to me when looked through the glass of Agile software development philosophy. 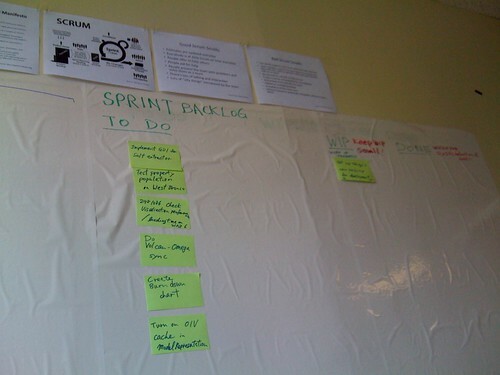 I am still too novice to start preaching about Agile project management with Scrum. So, I stop here just with reporting that I immediately set up a Sprint back log on the office wall instead of keeping it on the project web page. This visual management with big and tangible representation induced a lot of creative conversation among us right after the second it had been put up. I think it's a good start.